In 1905, George R. Lawrence, a photographer in the Chicago area, captured the attention of the US Army and Navy with his methods of aerial photography. President Theodore Roosevelt, fresh from the Spanish-American War, requested the US Army and Navy ask George R. Lawrence to demonstrate his “Captive Airship” method of aerial photography for potential military uses. Lawrence had successfully photographed entire factories, the Chicago Stockyards, and other Midwest scenes from the air. He was experimenting with ways to get good photos from a high vantage point. After a nasty fall coming down from a 200-foot-high tower, he was determined to figure out a way to use balloons or kites to get his cameras aloft. After demonstrations to the US Government, both on land and from ships, the Navy report indicated that Lawrence’s methods had promise, and the US Government should acquire rights to the concept and further develop the technique for military use. Lawrence, however, continued to improve a “train of kites” system, and he had his “Captive Airship” working when the 1906 San Francisco earthquake struck. Using a sequence of kites and guywires, a camera platform stabilized with three outstretched booms, and an electrical device to trigger the shutter, he was able to take some of the now famous aerial panoramic photos of San Francisco in ruins after the earthquake and fire. 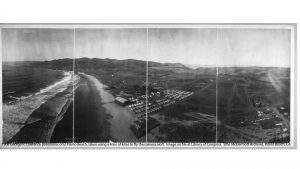 At the same time, the El Pizmo Beach Company was in need of photography to promote their newly upgraded resort in what is now the city of Pismo Beach, California. George R. Lawrence was hired by them to loft his camera above Pismo, then called El Pizmo. To take this famous picture, George R. Lawrence stood on the beach in front of where we now have our Addie Vacation Beach Townhomes https://gotopismo.com/, and he lofted his string of kites on the breeze off the ocean. 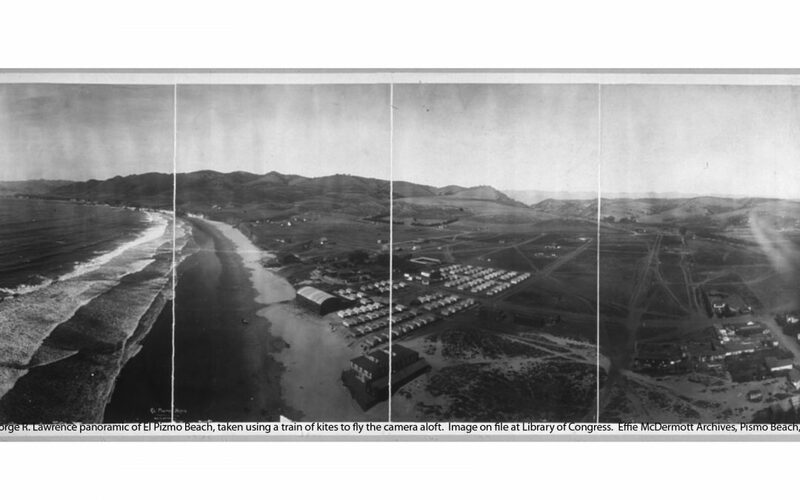 His 1906 aerial panoramic photo of El Pizmo Beach focuses on the El Pizmo Inn and Tent City. It pans, left to right, from the Shell Beach Hills in the distance to the north, and south to the vicinity of what would become the Red Light District of Pismo Beach, not far from where our vacation rental townhomes are now situated. It shows the beach, the town, the El Pizmo Inn, Tent City, the Pavilion, and the Wave Hotel. It shows homes and businesses sprinkled in the downtown area. It shows the livery stable which is the present location of Tomasco’s Salt Water Taffy shop. It shows the early school houses on what is now Bello Street, the clam cannery on what is now Cypress Street, and the overall lay of the land. Effie McDermott can be contacted via https://gotopismo.com/ where you can make your Pismo Beach vacation rental reservations and help support her historical research habit.